Firstly ask your friends or family members for recommendations on reception DJs and music bands from weddings, they've recently attended. There's nothing like a wedding guest to give you an unbiased point of view. Find out who was on the dance floor. Whom you hire depends on where you'll marry. You can not really have string music instruments on the beach or your violinist might be drowned out by the crashing waves. Similarly, a classical event will lend itself to big band sounds, which you would have a tough time fitting under a small tent for 100/120 people in your backyard. If you're marrying in a public place, noise restrictions may apply. 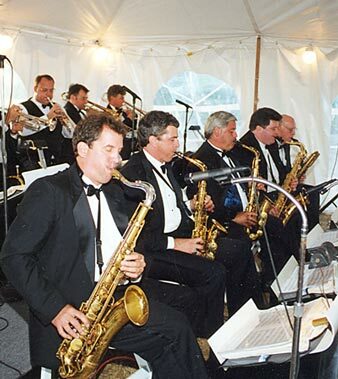 Find professional music band for play your wedding. It's absolutely necessary to see and hear your musicians before you book them. Prior to signing any papers are sure to ask for a sample, or if you can, see them perform live. If you've been given a demo CD, make sure you find out who exactly is on the recording which singers, how many instruments. If they're showcasing the all star 12 piece bands, and you're interested in the 9 piece ensemble, the sound may not be an accurate sample. Bands and DJs are typically hired for 4 hours, but if you think your reception might last longer, consider booking them for 5 hours. If you spontaneously decide to have them stay longer, you could incur steep overtime fees. . Probably more important than your play list makes your DJ or band swear up and down that they will follow it no matter how much cash is waving. While you're dancing, whisper soothing things to each other and keep each other grounded, because your adrenaline is going to be going so fast. Make sure videographers and photographers stay off of the dance floor. If they get too close, it can be a major distraction and catch you off guard. If you're using a prerecorded CD for your first dance song, write down the name of the song and track number for the person in charge of hitting play. Better yet, make everyone's life easier and copy the song on a blank CD so there's no mistake. Just bring a back up CD in case there's a problem with the cue. Don't forget to talk to your DJ or bandleader about what he plans on wearing for your event. It is little thing but we normally look everything about our special event. Wish you all the best. Keep tracking these things. Happy wedding ! Hey, a big thanks for giving these tips - really appreciated. Thanks in a million! Good post! Helpful tipswhen choosing something for entertainment on one's special day. Thanks!